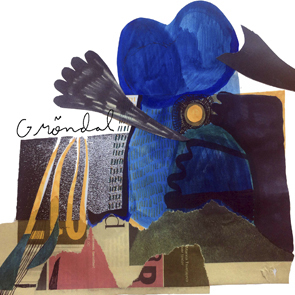 The brothers Max and Mauritz Agnas’ project "Gröndal" is a collaboration with drummer Sebastian Voegler, and the trumpet player Thomas Caudery. The music was written by both Max and Mauritz respectively, and was recorded on three days in January, 2016 at Gröndal Kyrka in Stockholm. Together, the four musicians approached the material quite spontaneously, giving rise to their own musical world, and now packed into this CD, along with the beautiful cover art by Tora Kirchmeier. "The first time I heard the brothers Agnas was at the Jazz club Jano in Täby, one of the small local jazz clubs that make up Swedish jazz basic ecosystem. The year was 2009 and the youngest Agnas brother Max was 11 years and the bassist brother Mauritz 13 years. Konrad sat On the drum chair and big brother Kasper at the guitar, from an already amazingly high level, the unlikely gifted brotherhood has developed considerably.Three albums under the designation Agnas Bros and alongside Konrad is Mauritz which belongs to some of the most in demand of their generation. Here Max Agnas, 21, and Mauritz Agnas, 23, have teamed up with the excellent drummer Sebastian Voegler and fine trumpeter Thomas Caudery. Gröndal named this airy crocheted chamber-specific report from the Stockholm suburb Gröndal church with original compositions by Max and Mauritz. Lyrical melodies are interspersed with broken syntax and fine groove as when Voegler plays openly and big against Mauritz sheaf tones in the opening to the other song We see. And with the best looking cover of autumn. "